I went up the coast to the NSW/QLD Border to visit my parents at Coolangatta who were holidaying up there with some friends of ours. 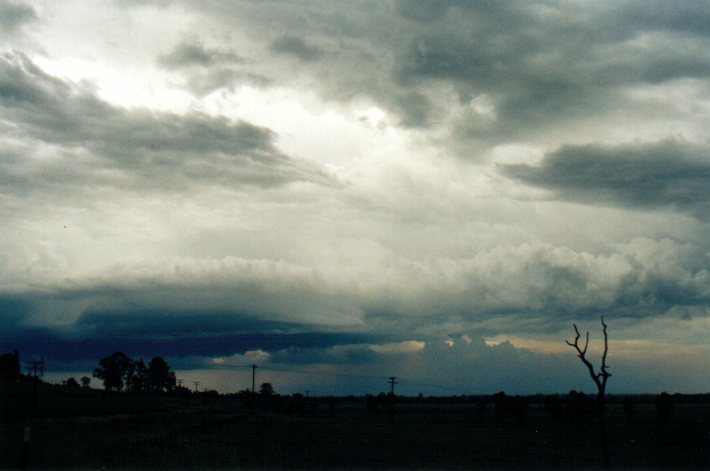 I knew there was a good chance of storms up there and back home in Wollongbar so I took my camera along with me in the hope of catching some action (not telling the people I was travelling with I was hoping to bag a storm). After spending much of the morning shopping we got back to the apartment to have some lunch. When we arrived at the apartment Cj's had sprung up everywhere on the Border Ranges to the south and to the west as well. And it was only 12.00pm!! It was looking pretty good for later in the afternoon. After lunch we headed for a swim in the pool. While all the others were splashing around I had my eyes glued to the cell that had developed to the south. 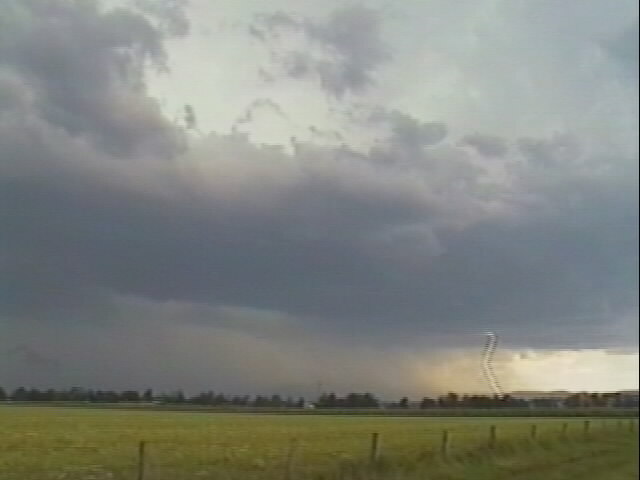 It didn't show any strong characteristics, just looked like a normal summer afternoon thunderstorm. This continued in an easterly direction and headed off out over the ocean. After that the sky to the south didn't look as active and all the larger Cj's began going up to the west and NW of where I was. At 2.30pm it was time to head back home to Lismore to drop off my friend to training. I fell asleep not long after we left (an annoying problem I have in cars!!!) and awoke in the town of Bangalow, 30km NE of Lismore. 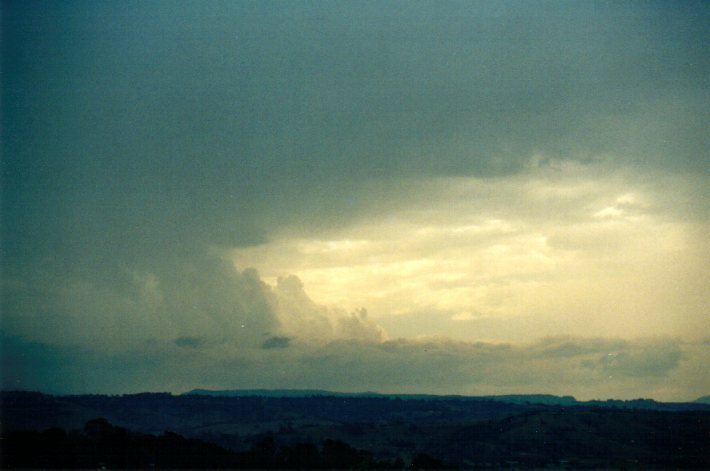 The sky was filled with clouds and I particularly noticed a cell that looked to be over the nightcap ranges. It was dumping a lot of rain but I couldn't see any lightning (not that I saw that much of the cell due to trees on the side of the roads etc). 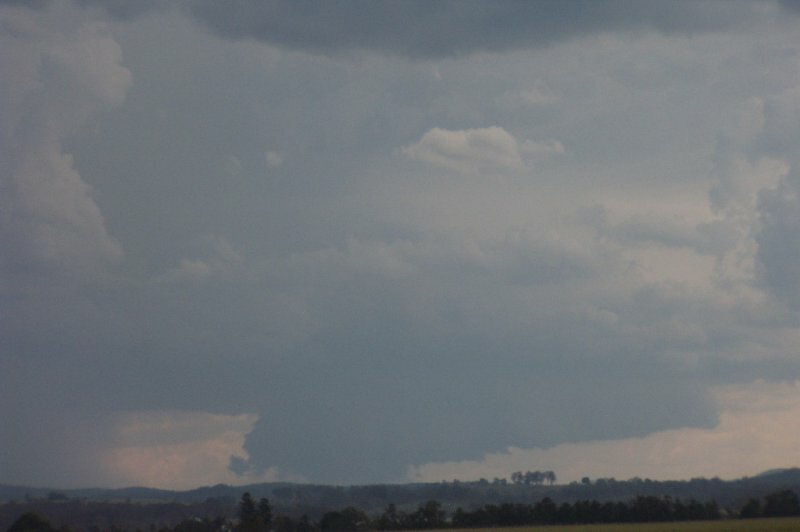 After watching this I noticed a dark area on the horizon to the SW. It wasn't really too far away but I spent a good 5mins trying to decide whether it was a cell or just a shower. 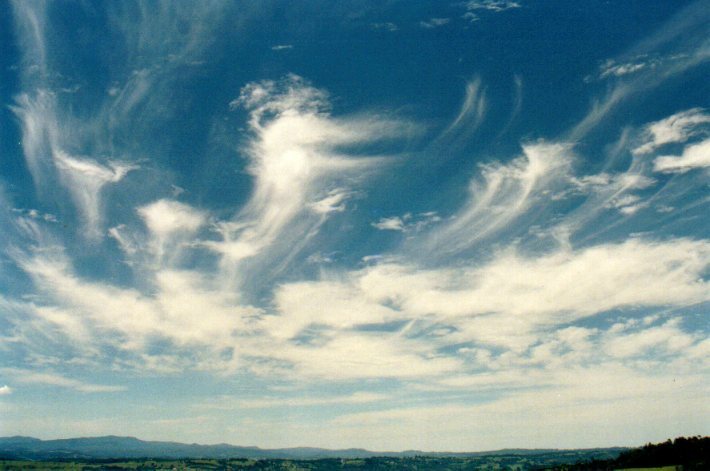 Then I realised the cirrus lined up with the dark area and clicked that it had to be a cell. 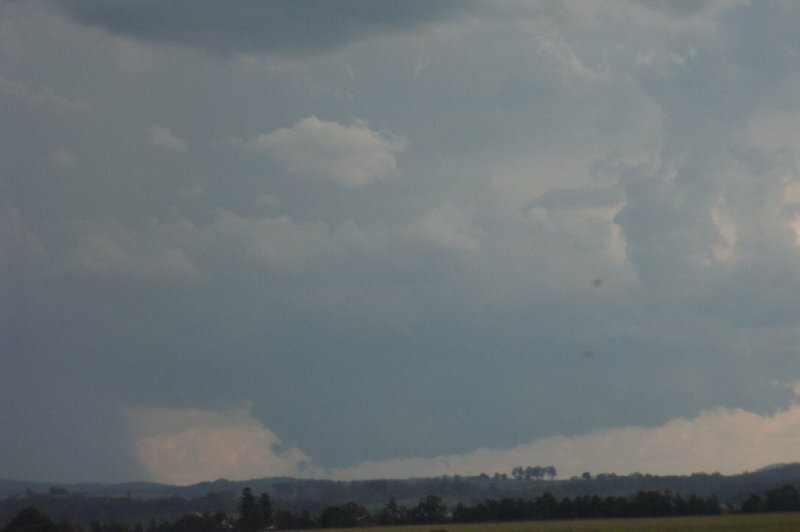 I didn't get a really good view of this cell until I was bout 5km NE of Lismore. 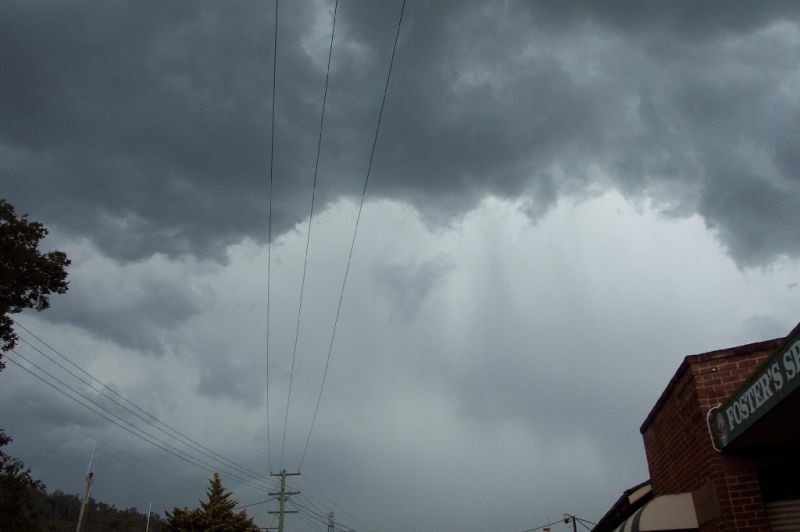 It was starting to precipitate although not over a large area. Lucky for me we were heading straight to it. We arrived at the athletics track in South Lismore at 4pm. Just as we got there it started to bucket down and the CG's began!! There were quite a few. 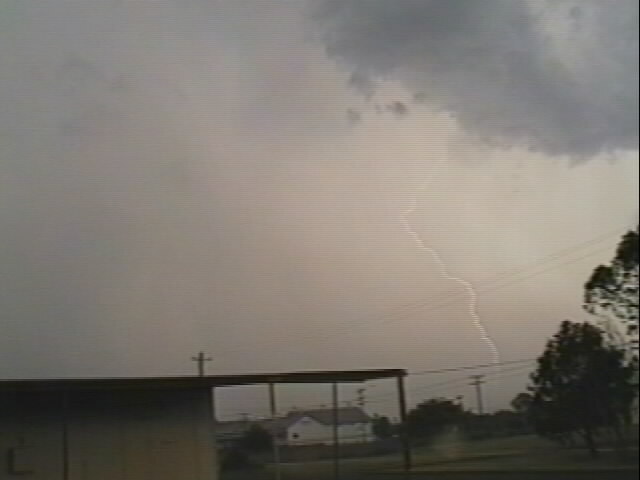 I hadn't seen any at all until it actually hit us. The outflow wind was also rather strong, but it was the heavy rain grabbing my attention. After a quick update from Michael we decided to wait it out and after about 20mins the rain turned to a light shower and the sun returned. 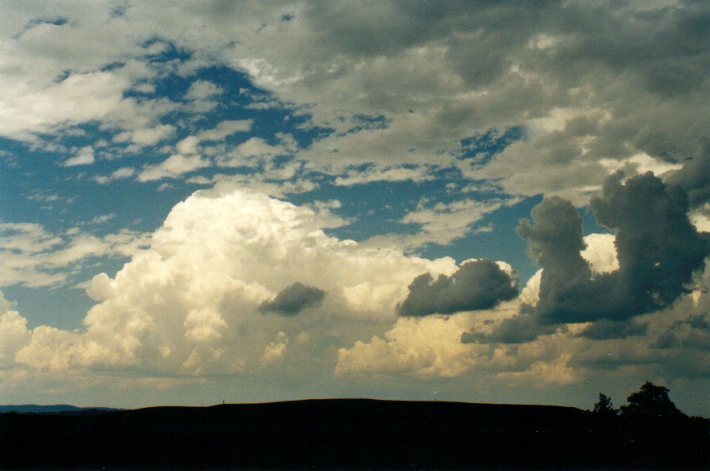 The cell was heading in a NE direction. After it cleared we headed back towards home but the water on the roads was amazing!!! It was gushing over roads in some parts. Branches were down in one area and I noticed what looked like a hail shaft/microburst to the NE of us. As it turned out some parts of North Lismore received strong winds that damaged buildings and also brought down trees, signs and fencing. Small hail was also reported. After I got home I logged on and found an STA had been issued. damaging winds and very heavy rain. 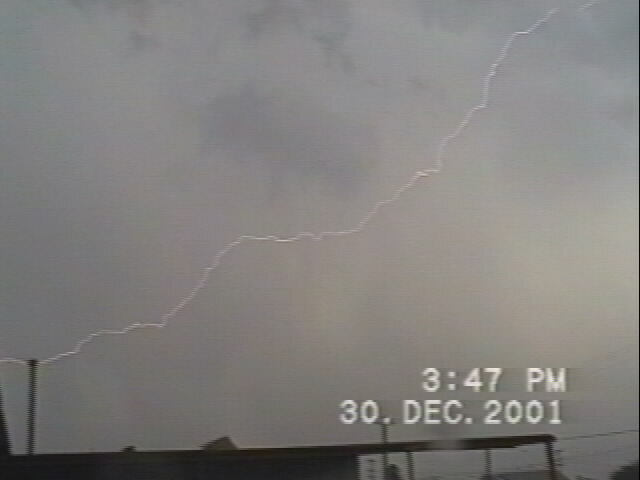 Michael experienced some very close CG's near his house including one 'flang' that scared his whole family!!! 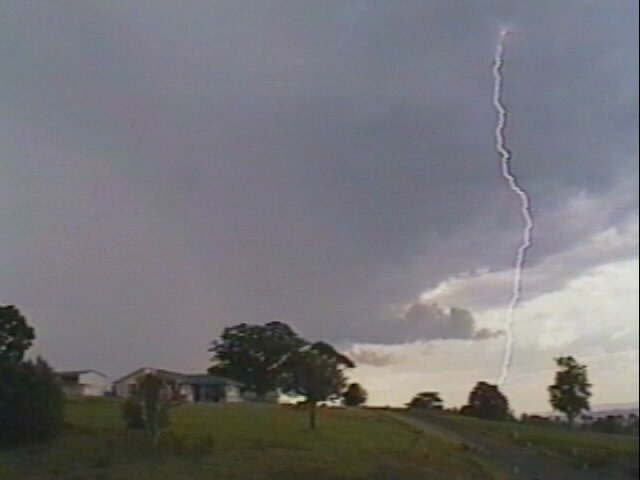 Only 4.2mm was recorded there with <1mm recorded at my place. 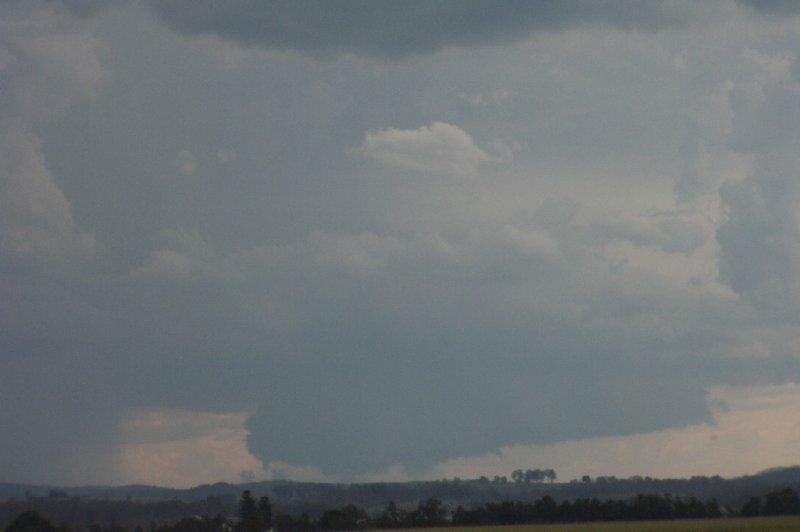 The following images were taken from McLeans Ridges, east of Lismore looking W to the cell that affected Lismore and N to another cell. 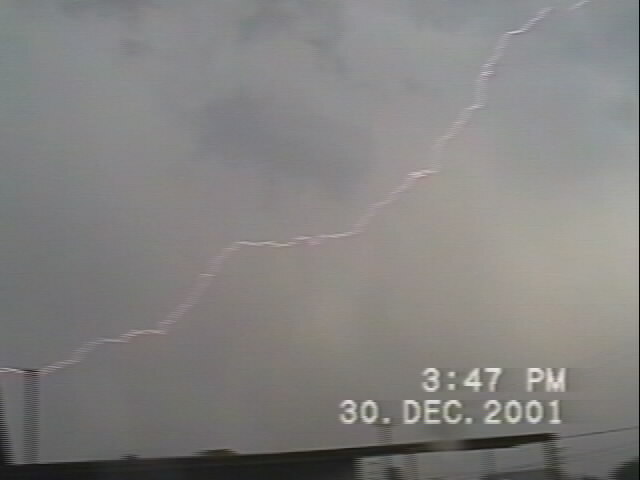 Some video stills of lightning are also shown. 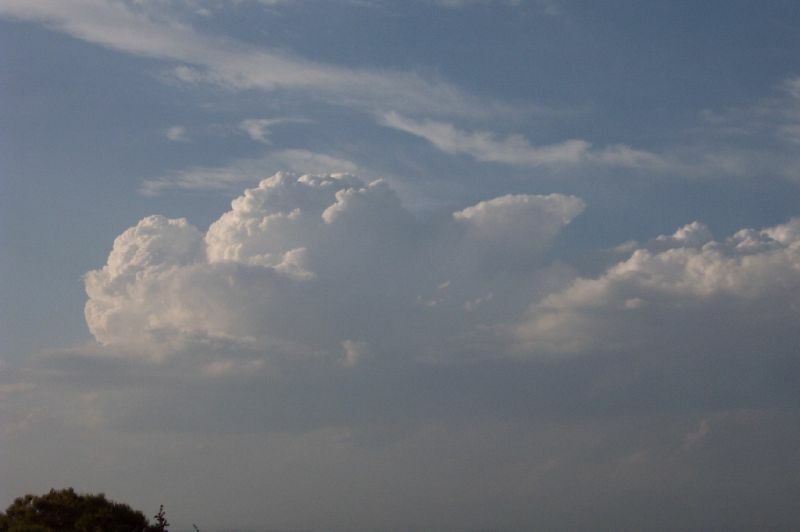 Cells continued to develop to the north of my place into the evening, but nothing close by. Just on sunset a nice tower went up capped with pileus. A nice way to end the day!! I was very excited that night about the prospects that the next day held. In fact I had a bit of trouble sleeping!! The setup for the 30th was pretty good, a broad area of Lifted Index in the -6 to -8 range, high moisture in the lower levels and some dry air aloft. Winds showed backing from NE to WSW though quite light in the lower atmosphere, but up to 40 knots by 500hPa and a 100 knot jet at 200hPa. The wind profile suggested storms would generally move towards the east today, with stronger cells likely to veer towards the NE. There was a cap, but high surface temperatures prevented this being a problem. An enclosed low over central NSW was analysed on the MSL chart with a broad trough extending NNW well into Queensland. 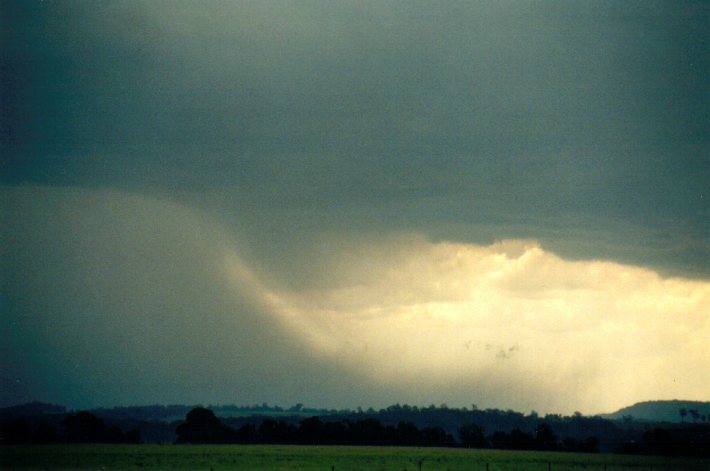 A weak high was positioned east of NSW/Queensland border maintaining a good moisture flow. 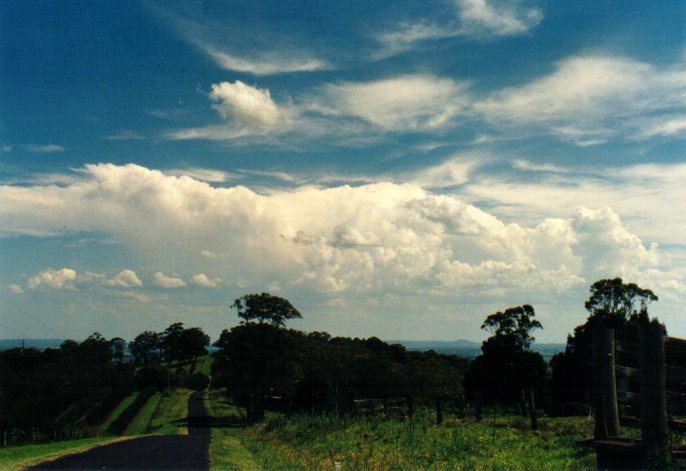 As often occurs, the first convection was evident on radar on the Dorrigo Plateau from around 11.30am, but encouragingly also quickly developed near Tenterfield to the west. About 12.30pm the BoM issued an STA for the Mid North Coast, Northern Rivers and eastern half of the Northern Tablelands. Being a Sunday the Northern Rivers chasers of Dave Ellem, Rodney Wallbridge and me were all available. I picked up Dave and called Rodney to meet us at a vantage point just N of Casino. 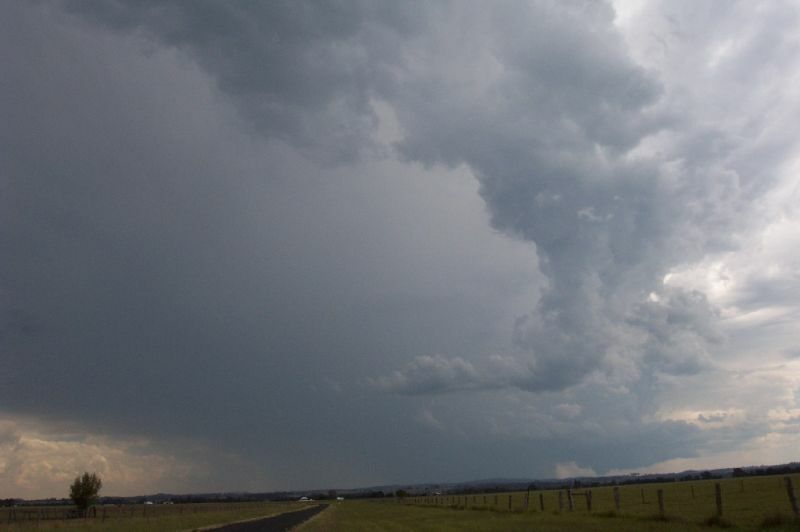 By the time we arrived there just before 2pm a strong cell had developed east of Tenterfield and was tracking ENE towards us. 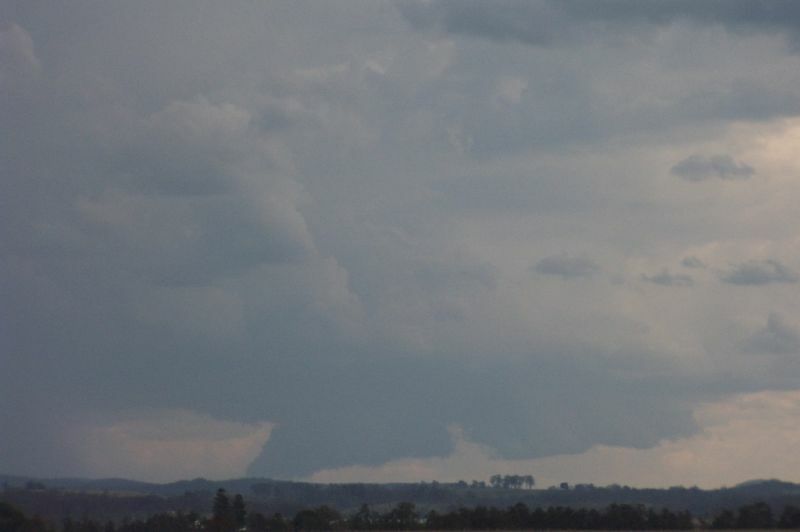 A very impressive rain free updraft region was established on the N and NE side of the cell, with several very nice lowerings or wall cloud features, some probably reaching the ground along the hills in the Richmond Range (about 40km to our W). 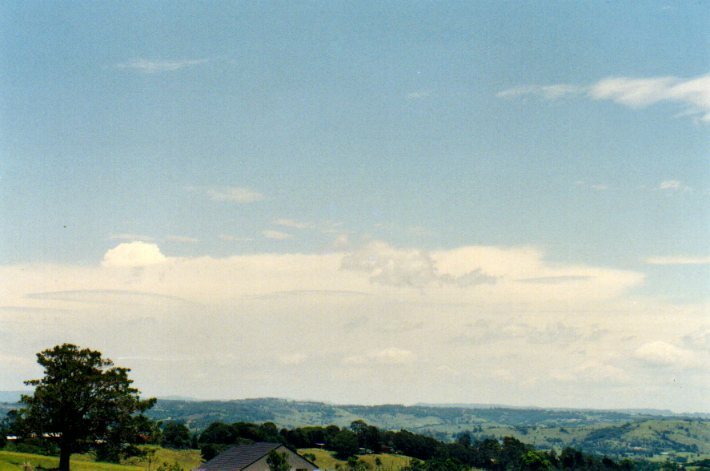 At the same time and extensive line of convection formed from SW to S, nicely contrasted behind the anvil of the storm to our W.
The following sequence of photographs were taken by Dave Ellem every 30 seconds or so apart and show what appears to be a tornado touch down on the left of the wall cloud region. An MPG movie of the images (282kb) shows the dramatic effect more clearly. 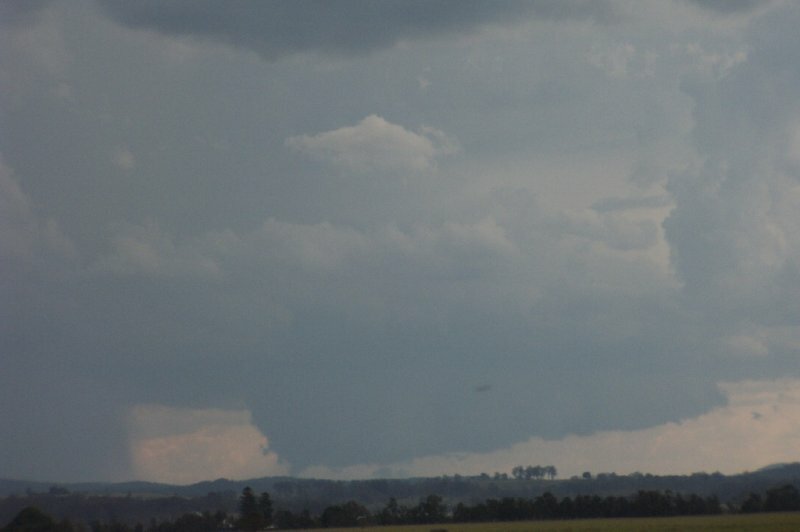 At the time this series of photos were taken (from 1.58pm - 0300z image on radar) the storm began to veer significantly left, after cell splitting occurred 30 minutes earlier. We remained at the location N of Casino for some time, watching as the cell grew larger and moved closer. 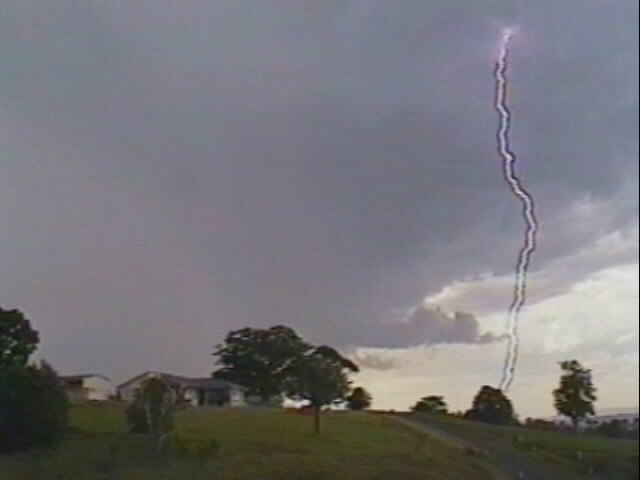 Several microbursts were observed as the now obviously severe storm edged closer. 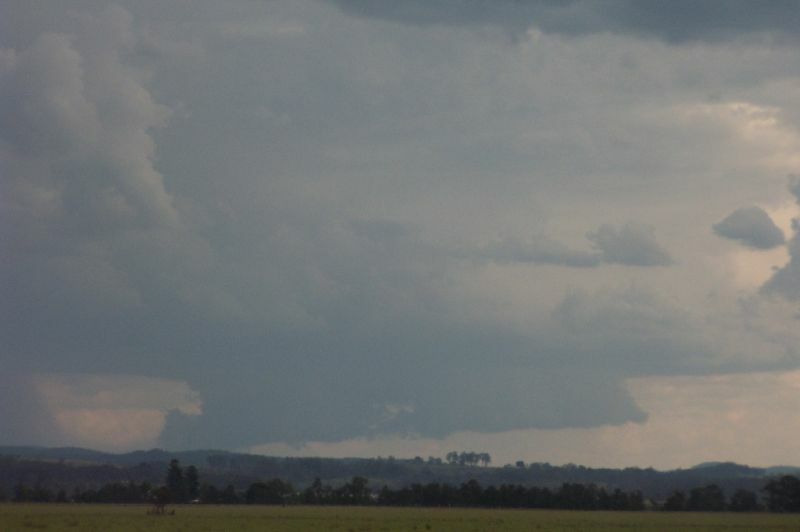 Shortly after 2.30 it was apparent to me that the cell was now moving towards the NE or even NNE, and would likely pass over Kyogle, 25km N of us. The storm was quite close by 2.45pm, the core about 10km to our W. It was still producing microbursts towards the north and had a huge rain free base which spread out towards the NE. 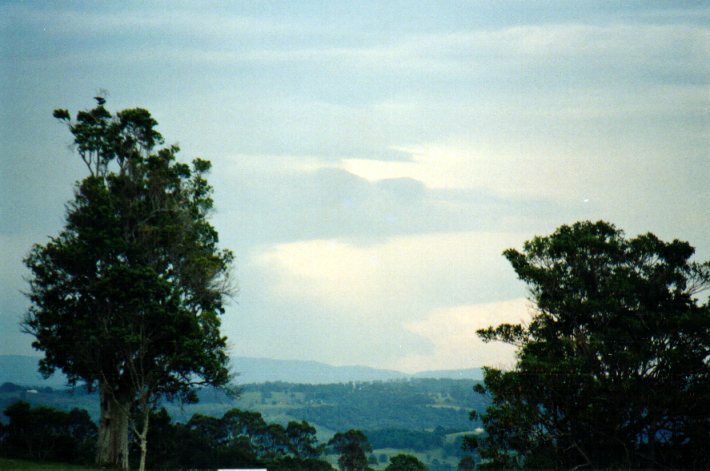 The anvil was thick and extending way off to the E. We took off up the Summerland Way towards Kyogle to maintain a good position. 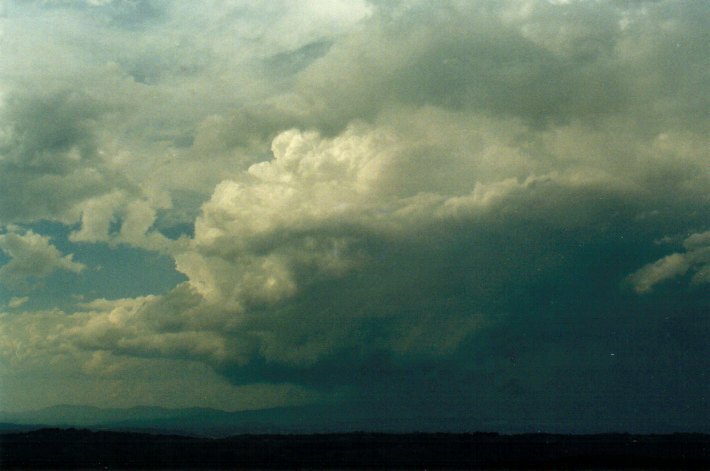 It was very easy to keep ahead of this cell - it was propagating quite slowly. 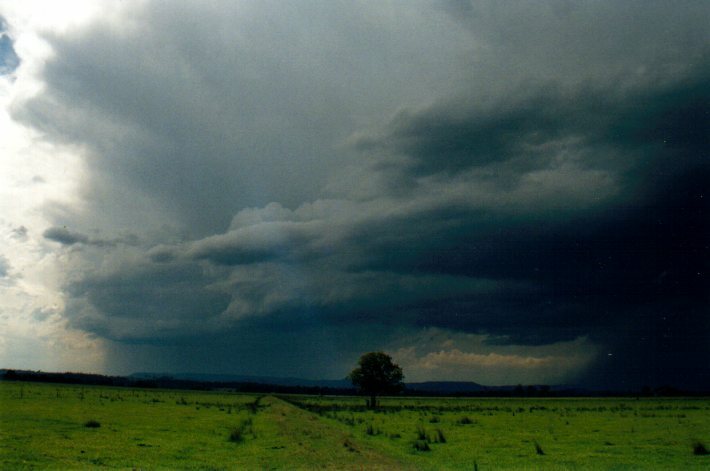 About 10km S of Kyogle we stopped on a farm road off the Highway to capture the scene. 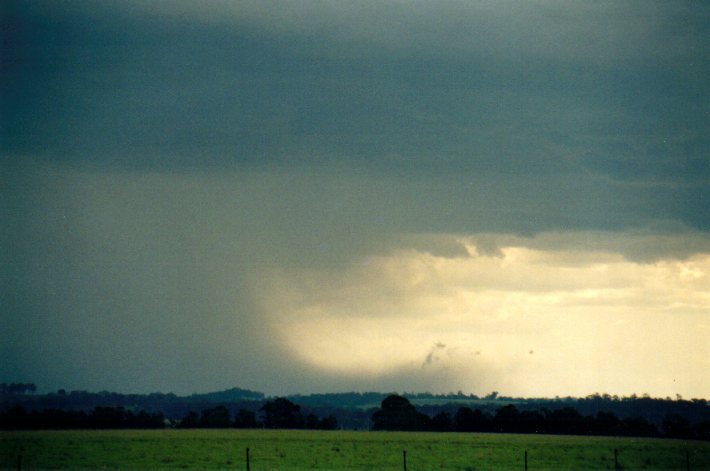 Very intense precipitation occurred, again with microbursts and some scuds near us and into the lovely rippled rain free area. 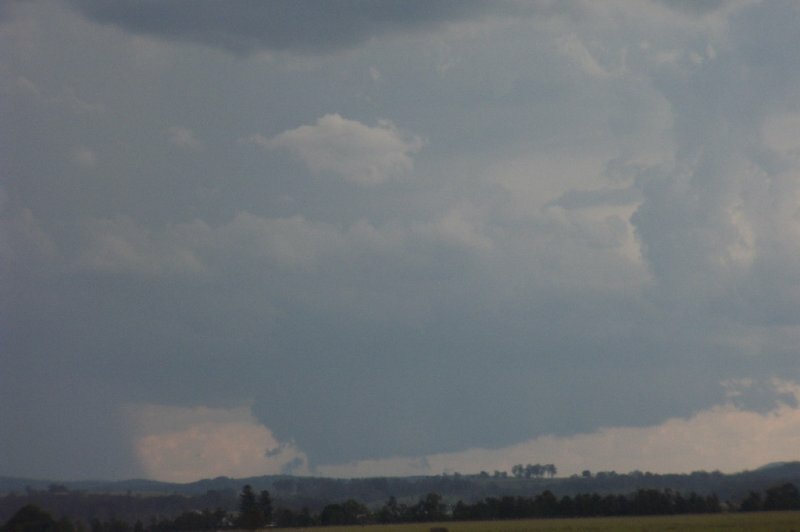 Visible CGs were not that frequent, mainly near the precipitation core, but the rumble of thunder was quite exciting. 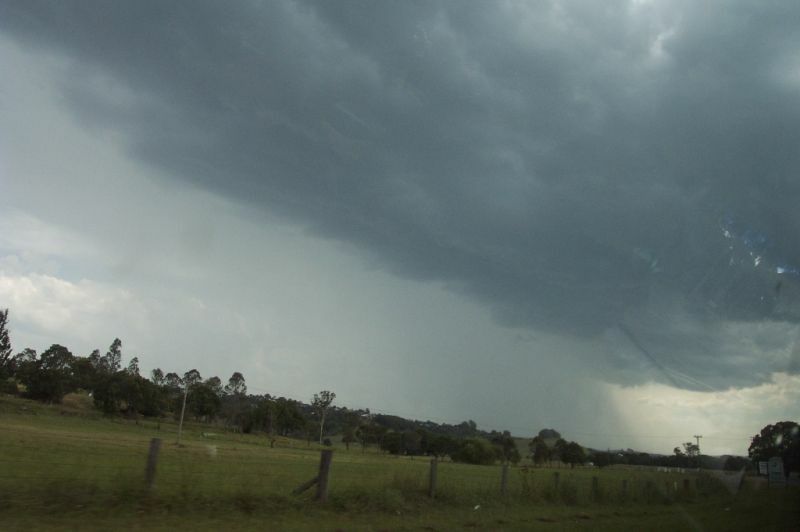 We kept just ahead of the storm, arriving in Kyogle about 3.20pm well before the storm did. 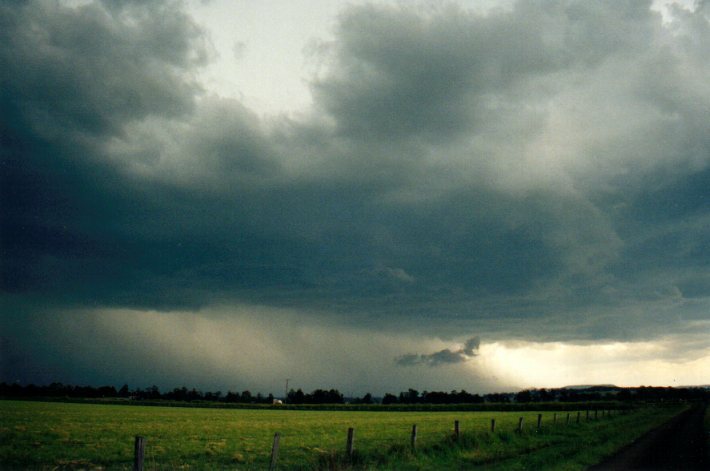 We observed the microbursts heading our way with many close CGs ahead of this. Rodney did not want to get any hail dents, I didn't care as I already had some, but we parked under a strong looking shop awning to be safe. 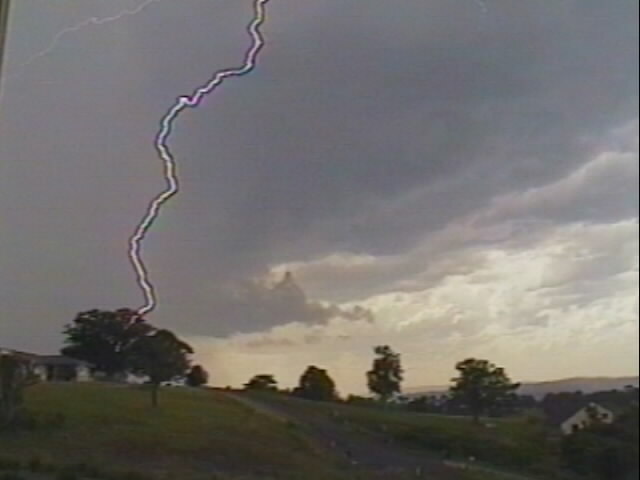 It seemed like ages for the storm to arrive, and by the time it passed Kyogle had in fact weakened. 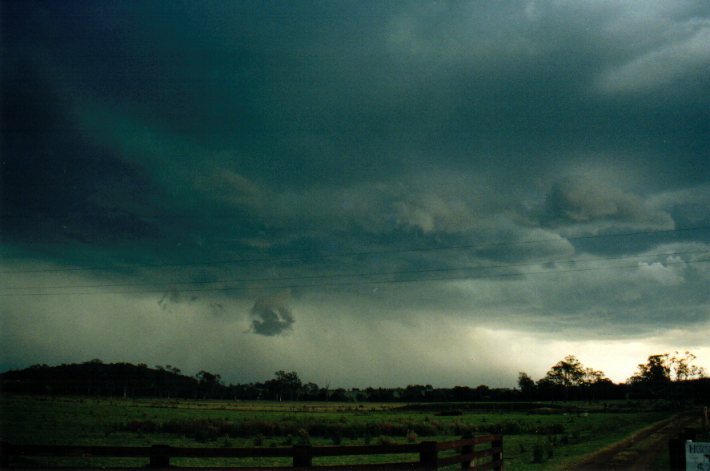 It was a bit of an anticlimax to only experience some strong squally gusts and heavy rain after anticipating hail and violent winds - though I'm sure the people of Kyogle were happy! 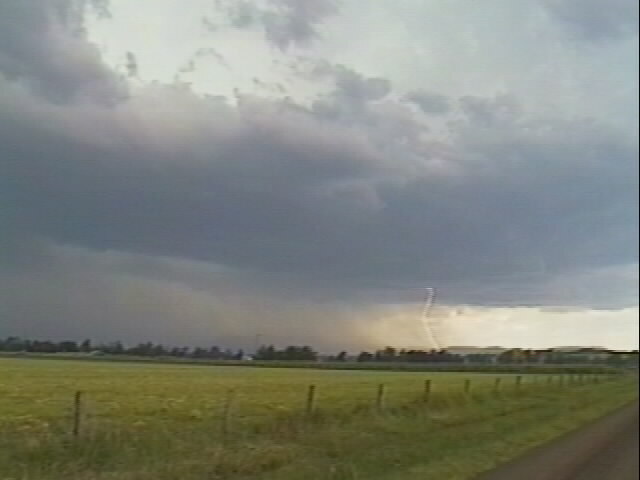 We headed back S while the cell seemed to re-intensify NW of Kyogle. 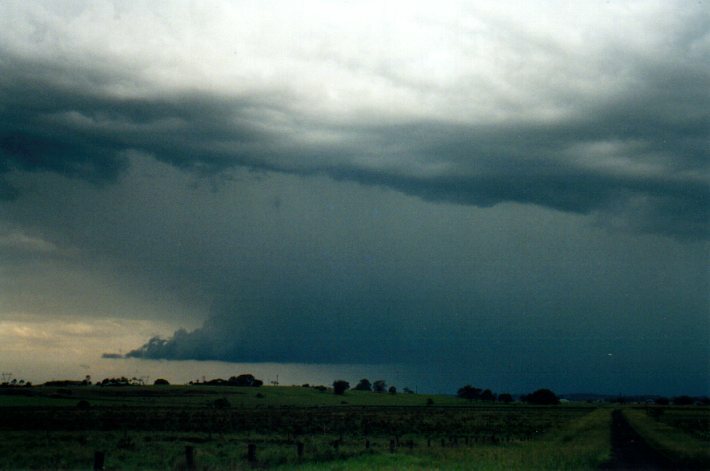 Back at the spot N of Casino, we again observed microbursts from the same storm, this time spreading out the rear flank towards the SW. Rodney heard via his radio network that a lot of hail has fallen at Mallanganee, which is about 40km WSW of Casino - it must have occurred there just after 2pm. Shortly before 5pm a roll cloud type feature had formed to our SE. 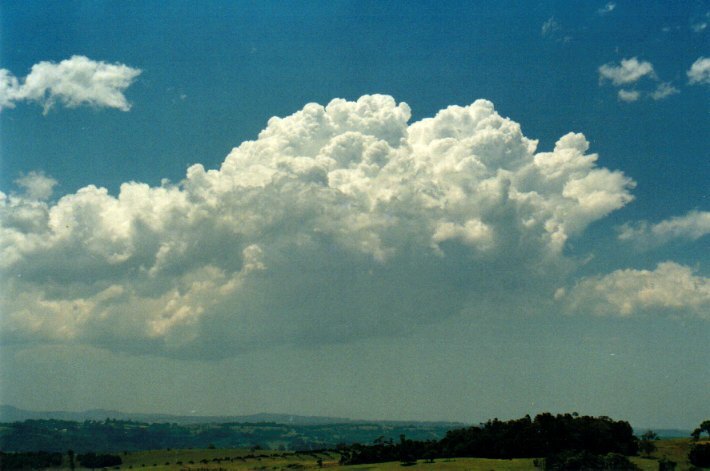 It was certainly interesting but we had not observed the convection developing behind it due to other cloud in the way. We all decided to head towards the formation as it was on the way home anyway. After just a few ks it was obvious storms were developing along an E-W line behind the roll cloud. A magnificent inflow region of the eastern side of the cell had formed with powerful CGs punching through this rain free area. It was beautifully contrasted. 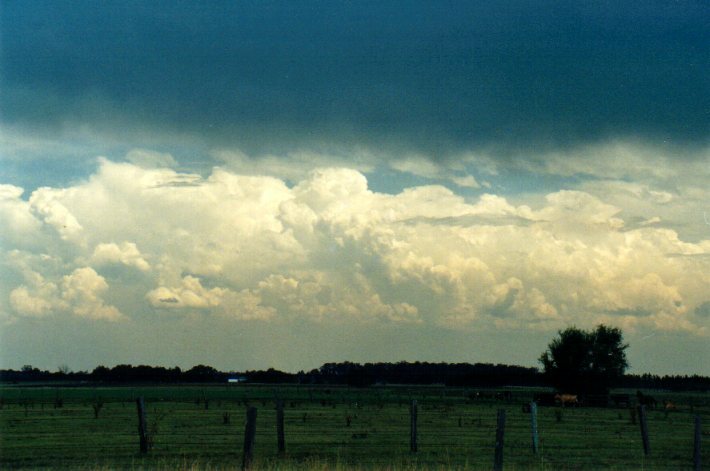 We headed towards it but it soon became totally outflow dominated as the cell dropped its precipitation. 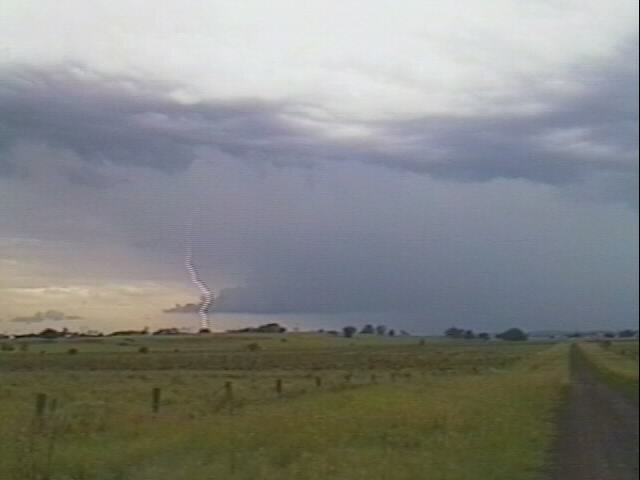 We drove into the rain with a few nearby CGs then called the chase over at about 5.40pm. 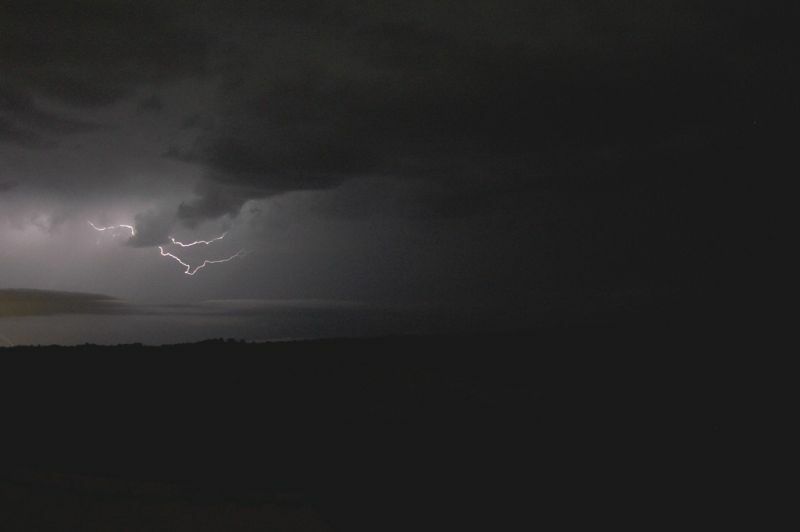 Storms passed through the region between 3 and 5am. I was awoken by thunder at 4am and observed lightning to the N and NW, but no rain fell at my location. 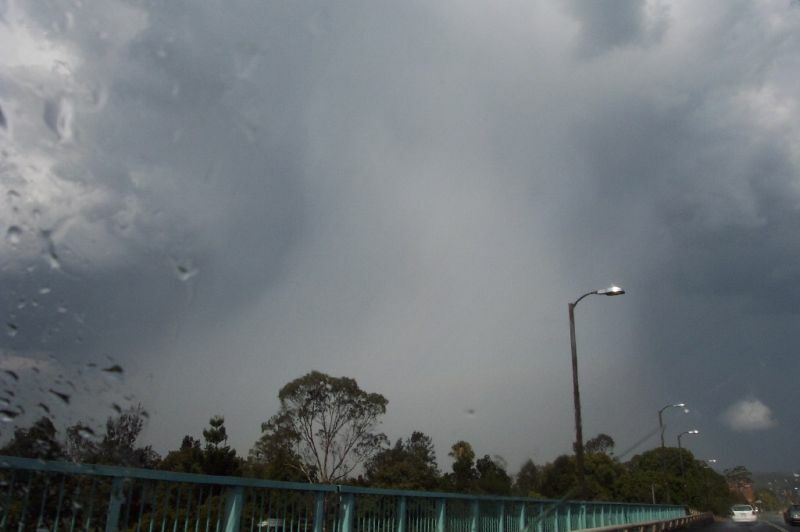 It was later reported that extensive thunderstorm activity had passed through Brisbane with falls up to 100mm in some parts. I had observed those storms passing out to sea after dawn to the far N.
The setup for today was a bit messy, high CAPE, some decent turning of the winds, but they were fairly light. It was also very moist throughout the atmosphere. 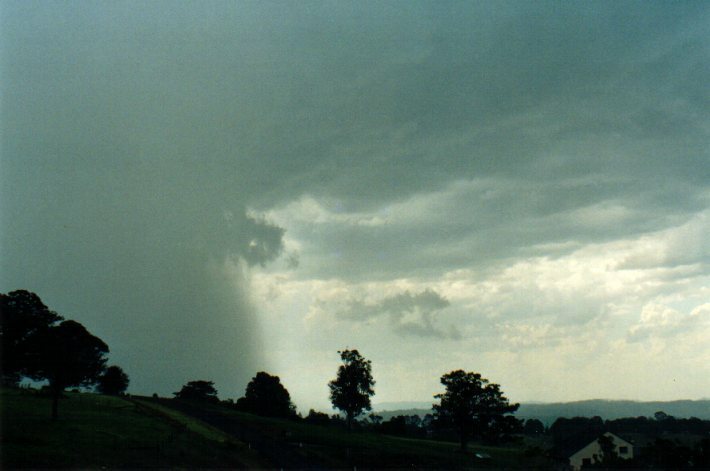 I expected some high precipitation cells to move through the Northern Rivers later. 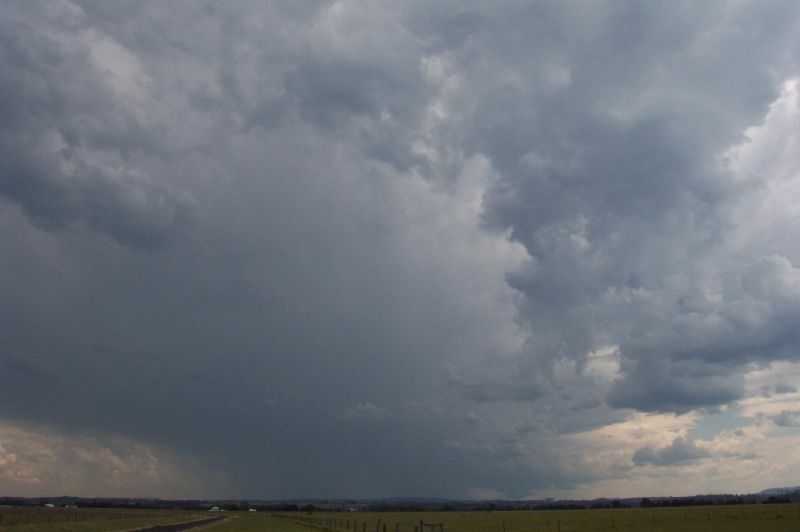 Thunderstorms formed early west of Warwick in Queensland and tracked towards the E. More extensive activity formed along the Northern Tablelands by about 1.30pm, again heading generally eastward. A couple of cells made it to "pink" on radar and veered slightly NE but nothing really got going. I observed a cell off to the W from 3pm onwards, it developed a shelf cloud type feature on the leading edge, but this eventually collapsed as the storm seemed to stall - it had in fact weakened and new development kept forming on a line NW of it. After expectations of a decent fall of rain, just a few spits was a big disappointment. 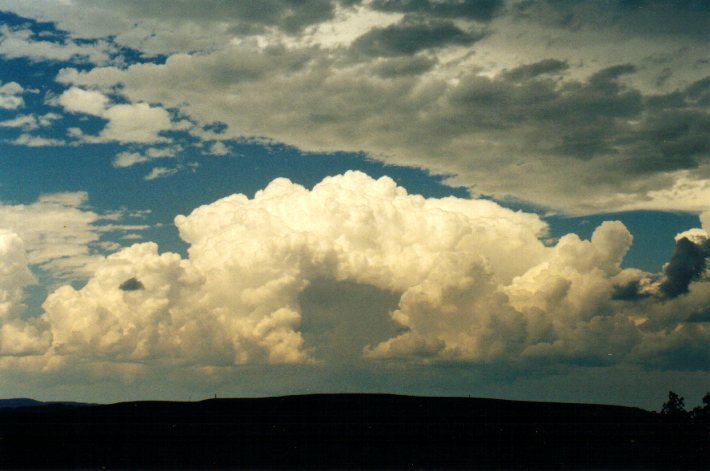 A hot day with fairly extensive cirrus and cirrostratus to the N. Conditions for storm development were marginal with a strong cap, which ended up being stronger than forecast. 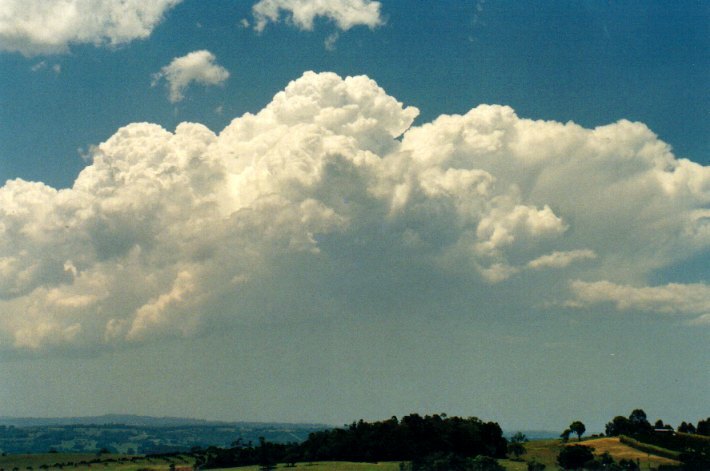 Cumulus congestus formed early afternoon to the W and extended down towards the Clarence region. Dave, Rodney and I headed out for observations at a nearby lookout hoping something substantial would form. We really needed activity to form more to the W and NW as the steering flow was towards the ESE. A line of high based low topped cells did get established about 60km S of us, near the coast. 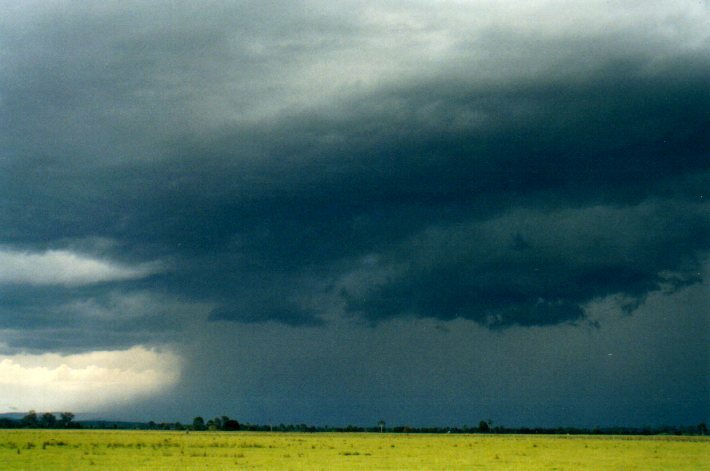 An STA was issued by the BoM but none of this activity really kicked off. Some other very weak cells did eventually form to the W, but collapsed near sunset. 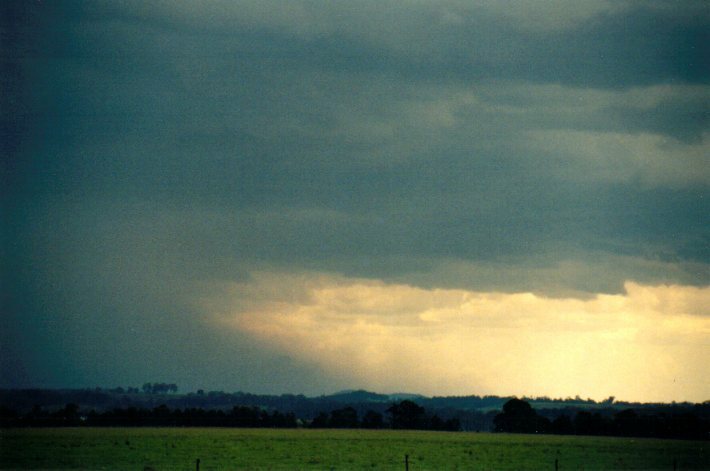 Temperatures were up to 40 in the Clarence Valley. I suspect this was enough to partially break the cap where the weak storms formed on this day.